Served with choice of two sides: cup of soup du jour or dinner salad, sweet corn cake, chef's vegetable, applesauce, coleslaw, rice, fresh-cut French fries, baked or mashed potato. 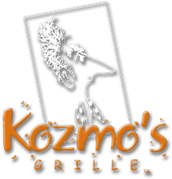 Substitute onion rings, Kozmo chips or sweet potato fries for $1 each. Add sauteed mushrooms, onions, hot peppers, or Otis bleu cheese sauce for $1.99 each. Perfectly aged center cut 10 oz. Certified Angus Beef NY strip steak. 8 oz. Certified Angus Beef sirloin sizzler is always Newman's first choice. Pork ribs prepared with a savory rub and slow cooked to tender perfection and glazed with tequila-chipotle BBQ sauce. Half chicken lightly seasoned and roasted to succulent tenderness. Also available with tequila-chipotle BBQ glaze. Pan-seared chicken breasts topped with mushrooms and Marsala wine sauce. 8 oz. center-cut prime pork rib eye prepared to your specification and topped with a bacon & pineapple chutney with roasted red peppers, scallions & zesty orange sauce.